Heat gas or charcoal grill. Stir together fruit spread, vinegar and oil; reserve 1/4 cup for glaze. Set remaining mixture aside. When ready to grill, oil grill rack. Place chicken on gas grill over medium heat or on charcoal grill 4 to 6 inches from medium coals. Brush chicken with reserved glaze; cook 5 minutes. Turn chicken over; brush with glaze. Cook 3 to 7 minutes longer or until juice of chicken is clear when center of thickest part is cut, brushing occasionally with glaze. Meanwhile, arrange spinach, raspberries, onion and almonds on 4 individual dinner plates. Slice each grilled chicken breast; place on top of salads. Drizzle with remaining fruit spread mixture. To Toast Almonds: In ungreased heavy skillet, cook almonds over medium-low heat 5 to 7 minutes, stirring frequently until browning begins, then stirring constantly until golden brown. 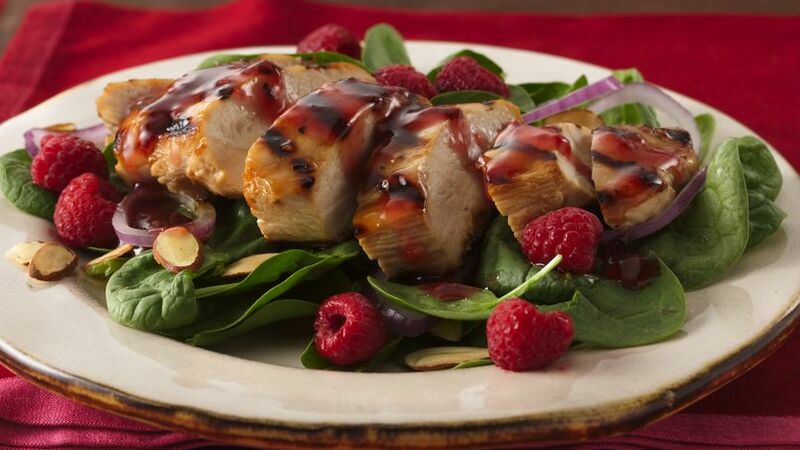 Homemade raspberry dressing with a touch of sweetness tops this attractive main-dish salad.